Welcome to The Residences by Onni Development Group. Here you’ll find luxurious spacious living, spectacular panoramic views, an impressive 30,000 square foot of amenities and unique architectural innovations at this ground breaking Port Moody condo high-rise tower called The Residences at Suter Brook Village Port Moody real estate development. Brought to you by the most trusted and experienced builder in the Tri-Cities, Onni Development Group introduces this stunning 26 storey tower that is nestled in a quiet community that is master planned from ground up, allowing maximum privacy for homebuyers and residents, while maintaining a convenient location close to all that Suter Brook Village community affords in terms of amenities and services. This vibrant social centre at the Onni Residences at Suter Brook Village Port Moody condo high-rise is also a multi-cultural hub, an all encompassing neighbourhood with the safety and spirit of an established community. Trendy shops, boutique stores, fine dining, eateries, bistros and cafes dot the tree lined streets in addition to services, grocers, office space, retail stores and banks. This master planned Suter Brook Village Port Moody real estate development is a once in a lifetime opportunity for Lower Mainland homebuyers with starting price points at an affordable $279,900* for one bedroom suites and $347,900 for two bed floorplans. The pre-construction Port Moody Residences at Suter Brook Village is the only pre-sale opportunity in Port Moody real estate market place and will be available to purchase this spring 2010. Urban living in the heart of Port Moody real estate is now available! Lcoated at the head of scenic Burrard Inlet, Port Moody real estate community is one of the fastest growing and most popular cities in the Lower Mainland. Located just twenty five minutes away from downtown Vancouver, this dynamic city is located in the midst of recreational adventure, outdoor discover and 17 scenic miles of waterfront, sandy beaches, stunning ocean and mountain views, public parks and trails. The Residences at Suter Brook Village Port Moody condo development by Onni is located along this vibrant residential and retail neighbourhood along Capilano Road. Visit our Suter Brook Village Residences sales centre and display suite today – now open for previews! We look forward to seeing you. The Suter Brook Village Port Moody Condo Sales Team located at 395 Capilano Road (just off Murray), Port Moody. 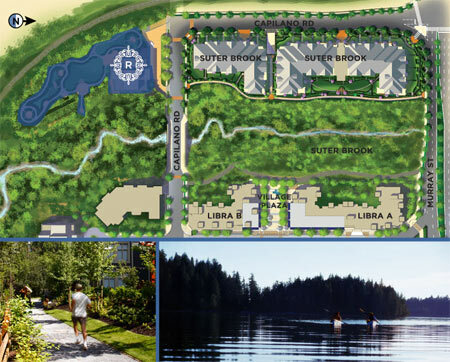 They are open 12pm – 6pm daily (except Fridays) and call ahead at 604-552-0552 for more details or visit www.liveatsuterbrook.com for the website that has just launched with all the information regarding these new Residences at Suter Brook Village Port Moody pre-construction condos for sale! Simply put, this is the most striking Port Moody condo high-rise in this city, and will become the landmark tower for generations to come. The next phase of urban condo living in the heart of Port Moody real estate district is now here at The Residences at Suter Brook Village community by Onni Development Group. 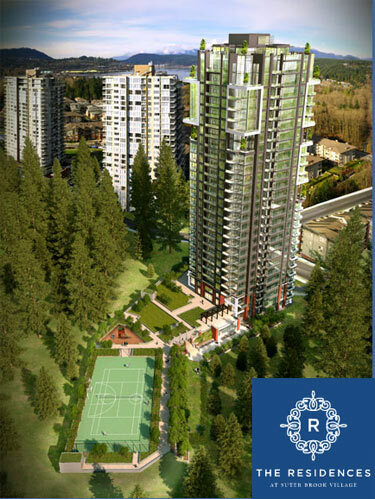 The Port Moody Residences at Suter Brook is a stunning twenty six storey condominium tower that is nestled in a private corner of this master planned neighbourhood and is designed by award winning Lawrence Doyle Young + Wright Architects of IBI Group. This new Port Moody condo tower features a combination of striking glass, metal and concrete construction with clean lines and refined architectural features. Adding depth, beautiful façade and a landmark tower to the Port Moody Suter Brook Village community, the Residences features unique skyhome designs with large covered outdoor terraces from 185 to 710 square feet in size. These entertainment spaces are ideal for extending interior space to the outdoors. These two and three level Residences at Suter Brook Village Port Moody condos for sale will also offer breathtaking mountain and inlet views. In addition, select new Port Moody Residences will also feature private roof top patios and terraces for year round enjoyment. Homebuyers and residents at these new Suter Brook condos for sale will enjoy sustainable design and development in addition to style and detailed craftsmanship throughout their home. What’s great about this new Port Moody Residences at Suter Brook Village condo tower is that it is perfectly situated next to an extensive network of trails, park spaces and greenery. A clubhouse for the discerning homebuyer, a place to entertain, socialize, play, work and relax. The Port Moody Residences Club at Suter Brook is the perfect place to do all of these things. From a game of basketball to tennis and from catering friends with a gourmet meal or having someone else cook for you, this entertainment space at The Port Moody Residences Club is unique, ground breaking and something that you will enjoy every day throughout the year. This spacious recreation haven offers over thirty thousand square feet of play and relaxation from a professional equipped fitness area to a games room, social lounge, yoga studio and media room. The Suter Brook Village Residences Club also features firt class indoor and outoor amenities that are broken down into this listing. As far as outdoor clubhouse space is concerned, nothing compares to the new Port Moody Residences Club that includes a compost area, fenced in dog park, yoga lawn and bocce ball court, children’s playground, barbeque area with built in pizza oven and multi sport court for basketball and tennis games. In addition, the indoor amenities at the Suter Brook Port Moody Residences Club includes such things as a media room to watch movies and proting events, a social lounge with catering kitchen, boardroom with wireless internet, games room, yoga studio, saunas, steam rooms and gym with plasma televisions. Nothing beats the Residences Club at Suter Brook Village real estate development by Onni! Some of the exterior features of the Port Moody condos at Suter Brook Village Residences include glass panel balconies, and innovative landmark skyhome deisgns with large outdoor terraces. In addition, this landmark Port Moody condo high-rise tower is surrounded by landscaped gardens and situated by the greenway trail system. The spacious home floor plans range from 640 to 1970 square feet with most homes have over height ceilings. There is a vehicle drop off area right of the entrance lobby on Capilano Road and the Residences at Suter Brook Village Port Moody condo development are very close to the proposed Evergreen Line transit system. All homes will have high efficiency washer/dryer, horizontal Venetian blinds, flat panel interior closet doors, durable laminate, berber style carpeting and 12×24 ceramic tiling for the flooring. Also, there are 2 colour schemes to choose from when purchasing your new Port Moody condo at the Residences at Suter Brook Village real estate development. The kitchens will have a sleek wall oven with Even Heat True Convection System, classic gas cooktop with full width cast iron grates, built in microwave/hood fan combo, high efficiency dishwasher with Whisper Quiet Sound Insulation System and EnergyStar fridge/freezer combo. There is task lighting, undermount stainless steel double bowl sink, garburator and either light oak or grey teak vertical grain laminate cabinetry in addition to solid composite counter tops. The pre-construction Port Moody Residences at Suter Brook Village condos for sale will have comfortable minimalist tub and or glass enclosed shower, glazed porcelain, undermount sink, 12×24 ceramic tiled flooring and solid composite counters like in the kitchen. Also, the pre-construction Residences at Suter Brook Village Port Moody real estate development will feature the 2-5-10 Year National Home Warranty, lobby enterphone with security system, well lit underground parking, key fob entry to common areas, pre wiring for insuite alarms and solid reinforced concrete construction. For more information about the pre-construction Port Moody Residences at Suter Brook Village condo high-rise, please visit the presentation centre today at 395 Capilano Road (off Murray Street) in Port Moody, BC. They are open every day except Fridays from noon to six.